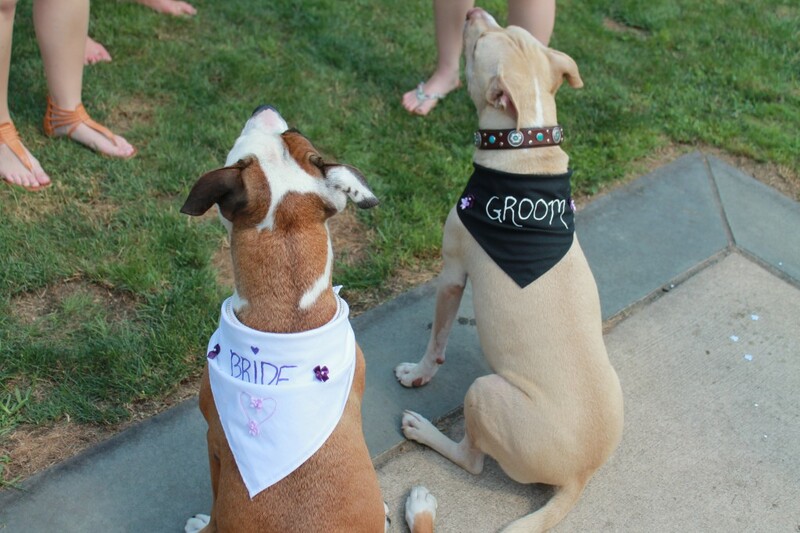 The puptials of Titus & Hailey took place on Sunday, July 14, 2013 at their home in Islip Terrace, NY. Hundreds of guests from all around LI and even as far away as Texas were in attendance to watch this dynamic duo tie the knot! Titus sporting a tux and top hat and Hailey a beautiful wedding gown, they had bwides maids too, their 3, four legged sisters, and even a human Best Man and Maid of Honor! 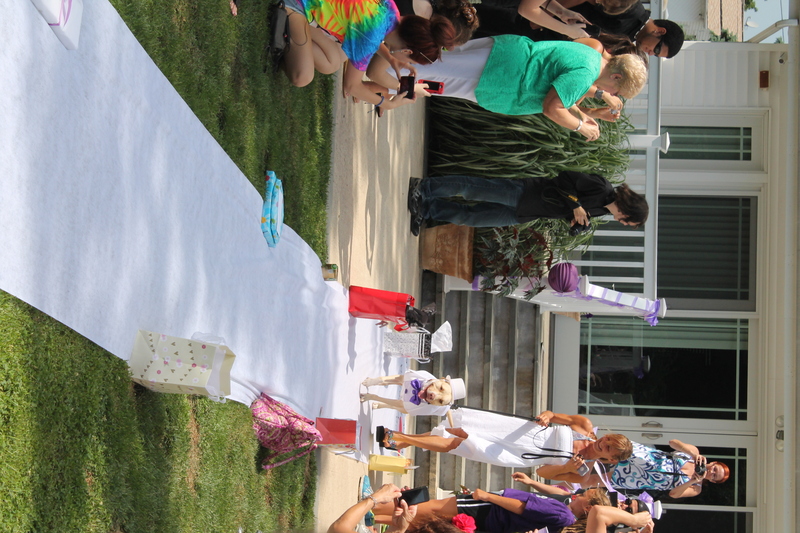 All the lovely wedding decor, gifts and donations wasn’t just for pomp and circumstance, but was a fundraiser for Tuff Tails Animal Rescue group. 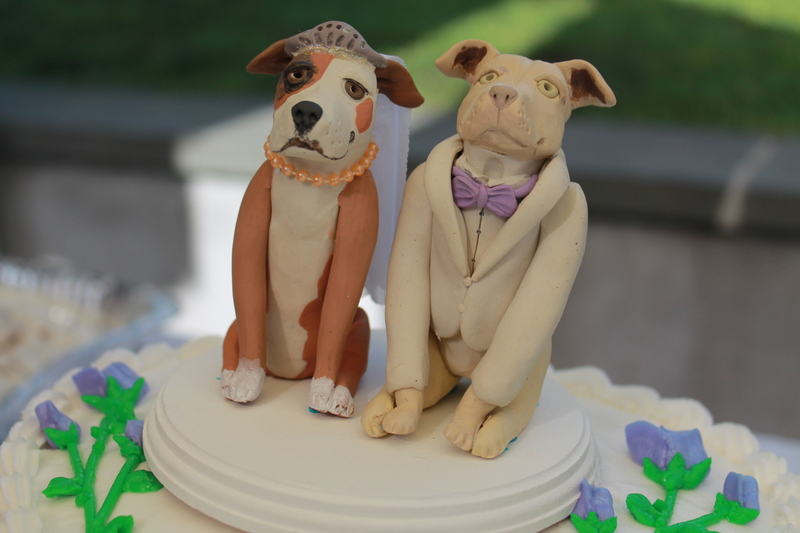 There were raffles, vendors, tons of human food (and treats for the pups of course) and evening a wedding cake adorned with, well a Titus & Hailey cake topper. After the ceremony, there was a reception of course, and the DJ also announced each bridal party member and of course the bwide and groom too. (It was pretty darn adorabull!) Hearing roomers this morning that the newly married couple spent the honeymoon suite together, it is a good thing they are both fixed! BOL!! (that’s Bark Out Loud!) For a lot more PICTURES click here. Woof! On Wednesday, May 22, 2013 at 7pm a different kind of pet benefit event is hitting the roof top of Toyota of Manhattan – LymeAid! It is not a drink, but the drinks may be green at this pet and human party. What is this event you ask? LymeAid is a first of it’s kind dual fundraiser for LymeDisease.org and Stray from the Heart animal rescue and to raise awareness about the awful Lyme Disease that both people and our pets often contract. While the disease is serious – LymeAide promises to be a fantastic time with music, dancing, pet celebrities (human and the four legged kind! ), scrumptious food and cocktails, raffles, photo booth, pet vendors, and so much more! Click here to see all the details and RSVP. 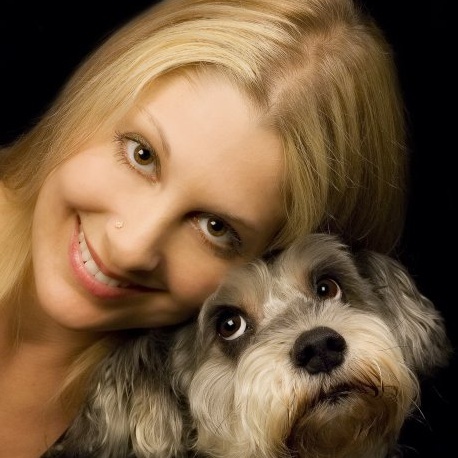 This event all got started because of pet industry expert, Nikki Moustaki of Nikki Knows Pets, who herself has a serious case of lyme disease for over 2 years now. Nikki wanted to raise awareness about the disease and help two organizations that are close to her heart at the same time. LIPetPlace: When were you diagnosed with Lyme Disease? Nikki: I was bitten by the infected tick in early February, 2011, and was finally diagnosed after 17 doctors in November 2011. Some people wait years for a diagnosis, so I guess I’m “lucky” in that way, but the infection had already reached my brain, and it’s very hard to root out from there. Most medicines can’t cross the blood/brain barrier — most organisms can’t either, but Lyme is very sneaky and can drill right through the barrier into the brain. One morning I woke up paralyzed on my left side, blind, and unable to speak. The symptoms can be that dramatic, or they can just be brain fog and aches and pains. Some people end up in wheelchairs. It’s a horrible illness. LIPetPlace: Do you know where you picked up the tick? Was it in Florida or somewhere else. Nikki: I was traveling with Pearl [her dog] from Florida to NYC, walking her in lots of shrubbery along the way, so my best guess is that I picked up the tick in the Carolinas, but I have no real way of knowing for sure. LIPetPlace: Your case is more of an extreme example of Lyme’s is that correct, or we just don’t know enough about it? Nikki: My case is a very typical case of Neurological Lyme. Lyme is a debilitating and often deadly disease. It affects every organ in your body. The symptoms are wide ranging, all are horrible, and most people have multiple symptoms at one time. For example, at my worst I had over 30 symptoms. I honestly thought I was going to die in my sleep every night when I went to bed, because I just knew that someone who felt as badly as I did could not possibly wake up in the morning. Then I’d wake up and actually be upset that I woke up, because I was so sick I wanted to die. Fortunately, I found a Lyme Literate Physician (there are very few) and he has saved my life. I’m still sick, but this disease takes patience and a variety of treatments over a long period of time. There are people far sicker than me, and people who get better faster. It’s a complex disease that’s not very well understood at this time, believe it or not. I encourage everyone to watch the documentary, Under Our Skin, if they want to know the truth about Lyme and why it’s so difficult to diagnose and treat. LIPetPlace: What do you suggest to people and pet owners as a preventative so they don’t get bite by a tick, but still live their lives? Nikki: I recommend tick protection on all animals. For humans, there is clothing that’s treated with a natural chemical that will repel ticks. Do tick checks on your loved ones when they come indoors from walking in the grass or hiking. As for me, I’m scared of grass now, and bushes, and weeds! You wouldn’t catch me camping or hiking for a million dollars. That’s how horrible and devastating this disease is for me, and for most people who don’t catch it in time to eradicate it. LIPetPlace: This is the first LymeAid event, I have never heard of anyone doing an event for Lyme Disease before. In raising awareness about the disease through the event what else do you hope to accomplish? 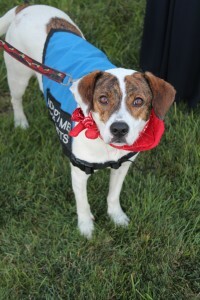 Nikki: During the month of May, Lyme Disease Awareness Month, there are several benefit events across the country, but I think that we are the first dog-friendly Lyme event. Dogs get Lyme too, and it’s important for pet parents to learn about this illness as well. I know for a fact that I got my infected tick from my dog Pearl. LIPetPlace: and last one…What are you looking forward to most at the benefit? Nikki: I want to say that I’m most looking forward to the cupcakes! But I can’t eat cupcakes because of my strict ‘Lyme Diet,’ so I guess I’m most looking forward to seeing all the doggies and listening to the amazing entertainment that we have lined up, including the band, Damn Glad and the Presidential Inaugural poet for 2013, Richard Blanco. The event is catered, we will have an open bar, lots of fun things to do and see — it’s going to be a blast! PetCareRX, Natura Pet, Tick-SR and Critter Zone. Click here to see all the amazing companies that are donating product to the swag bag, who will be there as vendors and much more. Tickets are $20 per person (in advance) $25 at the door, and if you or you dog wears any shade of green – you will receive raffle tickets! 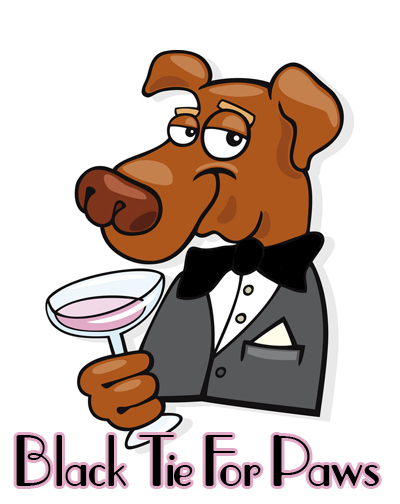 If you haven’t heard by now the 2nd Annual Black Tie for Paws is coming up this Saturday, March 23, 2013 at 6pm – midnight, hosted by Doggie U K9 Academy in Bay Shore, NY. (41 Saxon Avenue). This year we have a bunch of new talented dog acts as part of our entertainment, live band, lots of dancing, great food & refreshments for the humans and doggies alike and of course the Pet Fashion Show – where anyone can enter their dog into the show and walk the runway! 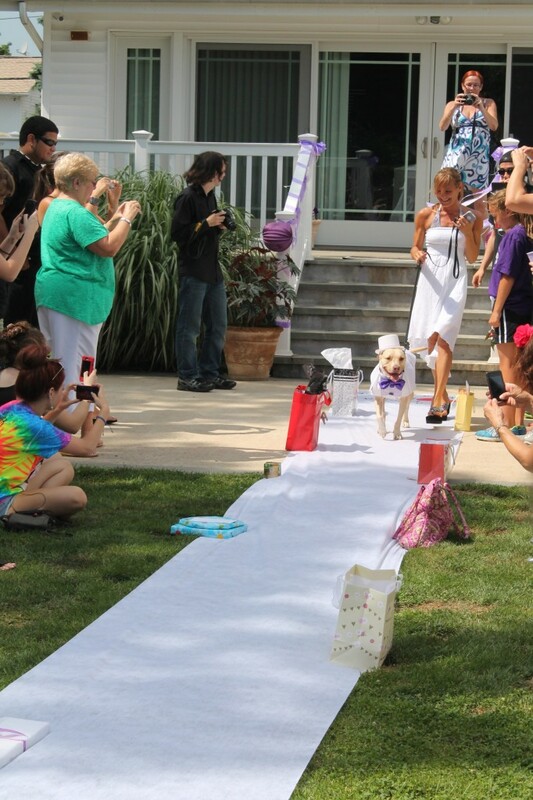 We have 3 guest judges from Long Island for the Pet Fashion Show, Gem Magazine Publisher Tanya Lee, Suffolk County Legislator Tom Climi and Nook & Cranny Gift Boutique owner Lori Stuck Zegel!! 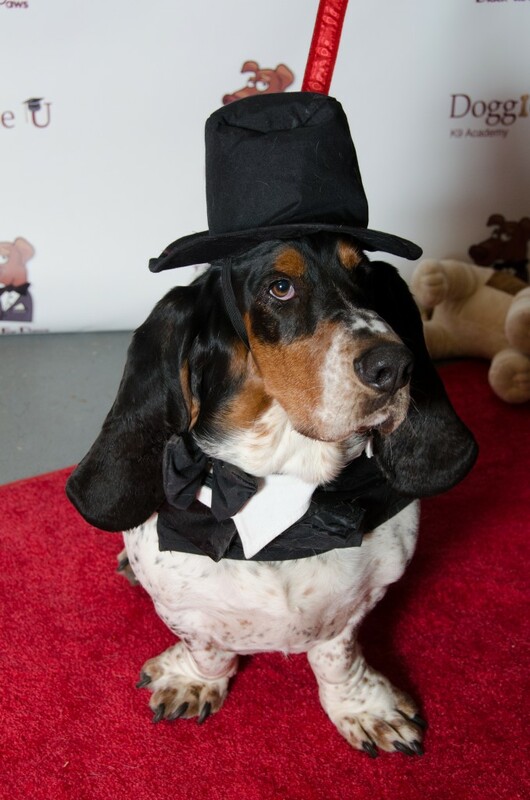 Also tons of pawesome raffle baskets and much more….don’t forget the red carpet, step & repeat and photo’s from 6-9pm by none other than ThePuparazzi! This fun filled benefit will benefit TWO amazing rescue groups that work locally here on LI with animals in our shelter, Shelter Link and Almost Home that help in the community, educate and offer many programs to help homeless and owned pets. How cool is that? A joint benefit – we loved to see people work together! Tickets are on sale here, and are $10 extra the night of, so you can purchase tickets online or head to Doggie U K9 Academy and purchase your tickets directly on site and save. Cocktail attire or Black Tie attire is requested for you and your pups!! People from all over LI are expected as well as many of our NYC, Brooklyn, Queens Pet people too! You may have seen the News 12 coverage about it last week or some of the press about the upcoming event too! This is great event that helps two wonderful groups – we hope you can join us in helping them continue to do what they do by attending this event!! Oh and did we mention the gift bags for attendees as a thank you for coming? Nice! Can’t wait to see you and your dog dressed to the K9’s! Check out Doggie U’s Facebook page! for updates throughout the week too! It was a beautiful evening for the 3rd Annual ‘Unconditional Love’ event benefiting the Southampton Animal Shelter Foundation (SASF) on Saturday, July 21, 2012 in Southampton, NY. 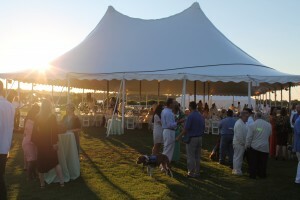 Held at the beautiful waterfront private residence of Sandra McConnell the evening’s event included honoring event Chairwoman Jean Shafiroff and Southampton Animal Shelter Foundation’s President Jonathan McCann honored Chuck and Ellen Scarborough at Southampton Animal Shelter. Strolling the grounds there were also adoptable pets available for adoption at the shelter. Summer and Smokey stood out in the crowd as well as the cutie pie, Captain Jack who came to the shelter scared and nervous – but thanks to the amazing trainers and staff, he was nothing but sweet, happy and said hello politely to anyone who came to him. Over 300 people attended the elegant affair complete with a silent auction, cocktails and dinner and dancing to this year’s fete and live entertainment was provided by the Alex Donner Orchestra. The event was emceed by NBC’s Jane Hansen and some of the guests included Martin Shafiroff, Elizabeth Shafiroff, CeCe and Lee Black, Somers and Jonathan Farkas, Lydia and Rudy Touzet, Jean Little and Howard Marton, SASF Founder Susan Allen, Board Exec. V.P. Sony Schotland, Treasurer Steve Greenfield, Board members Joel Cooper and Jay Durante, and Darlene Rodriguez, David Ushery and Lynda Baquero from NBC, Southampton Village Mayor Mark Epley and his wife Marianne among many other guests. The event helped raise over $375,000 for SASF which was founded in 2010 as a call to action when the town decided it could no longer care for the animals at the town shelter premises. Not only were the 225 animals currently housed there in jeopardy, so were all others that would be found. The Southampton Animal Shelter Foundation offers a low-cost spay/neuter clinic to help combat pet overpopulation. 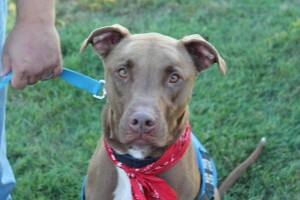 All privately owned pit bull type dogs are spayed or neutered free of charge. 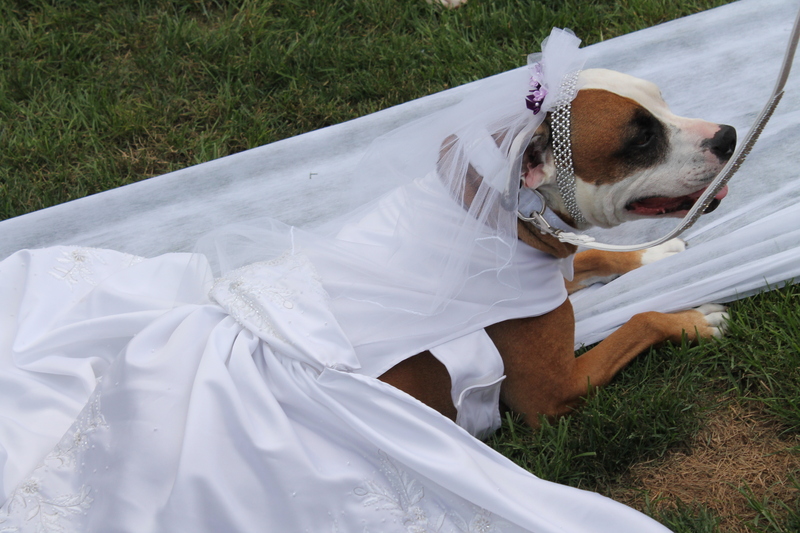 Dog obedience classes are also offered to the public. The Shelter is a non-profit organization relying on the generosity of individuals and businesses to help save lives at the adoption center and provide much-needed programs that benefit homeless pet. Friday’s stormy weather could not keep at least 60 die hard Pack Ethic supporters and fans away from the ‘Whine & Apawtiser’s’ fundraising event at held at Baiting Hollow Vineyard & Horse Farm. The event drew in people as far away as New Hampshire and even Elwood and his mom Karen Quigley traveled 7 hours (traffic!) from Philadelphia to be part of the festivities. Who is Elwood you ask? 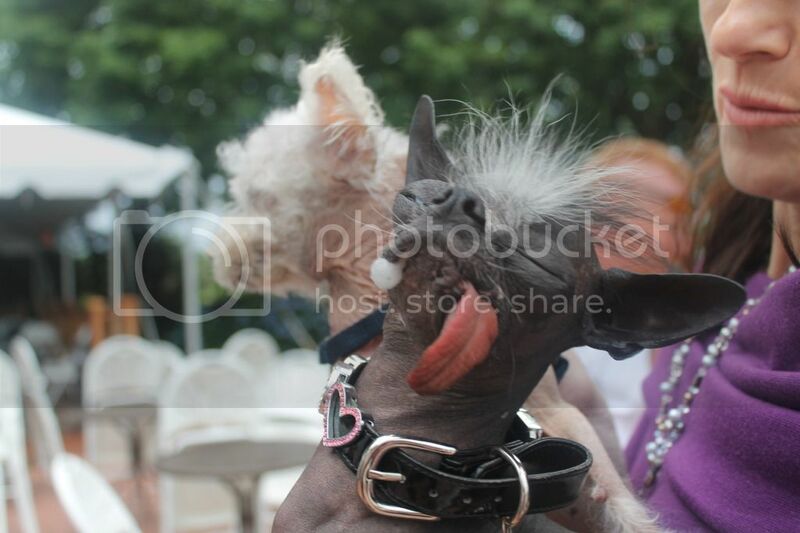 Only one of the World’s Ugliest Dog’s – no really he is the 2007 winner of the world wide contest. It just goes to show people are not just passionate about animal rescue but know an amazing group when they see it. Eric Bellows and Keri Whitfield are the life and breathe of the pack of dogs they live with, reform if needed, train and adopt out of Pack Ethic. As their website says, “Two people – One Home – Twenty Four hours of care…Pack Ethic Rescue is a dream – realized.” Whine and Apawtisers was a fundraising event to help them continue what they do to save lives – and they are not your typical rescue group, as the pack lives with them and are not kenneled. 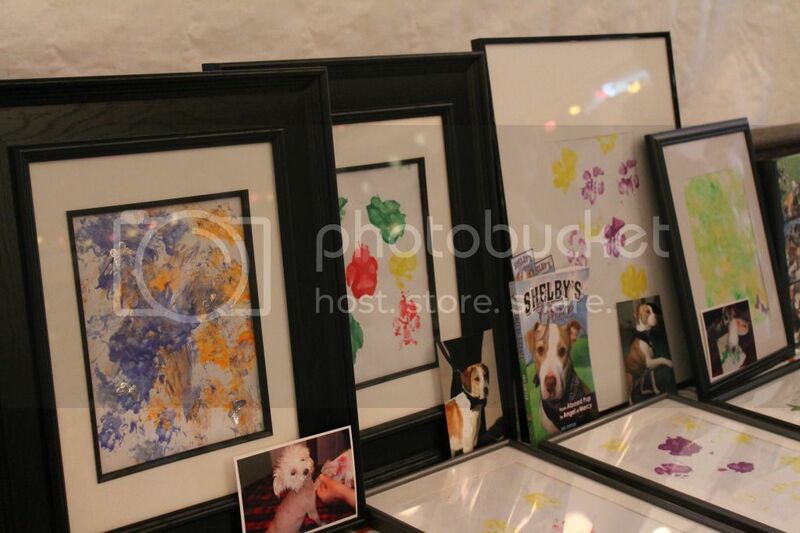 There were ton’s of raffle baskets, and art auction done by Pack Ethic dogs and ones that have been adopted. 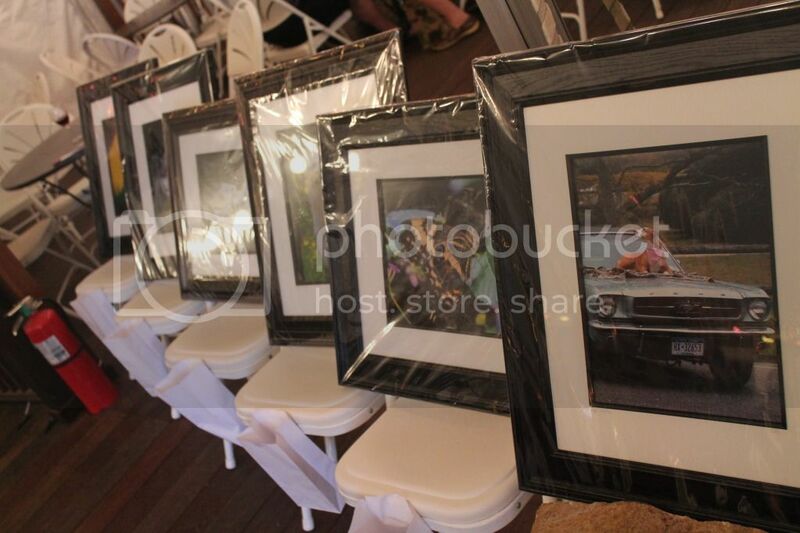 There was also a generous donations of beautiful photos raffle off, taken by a Kyle Hubbs, a Junior pack leader and excellent photographer at just 14 years old. 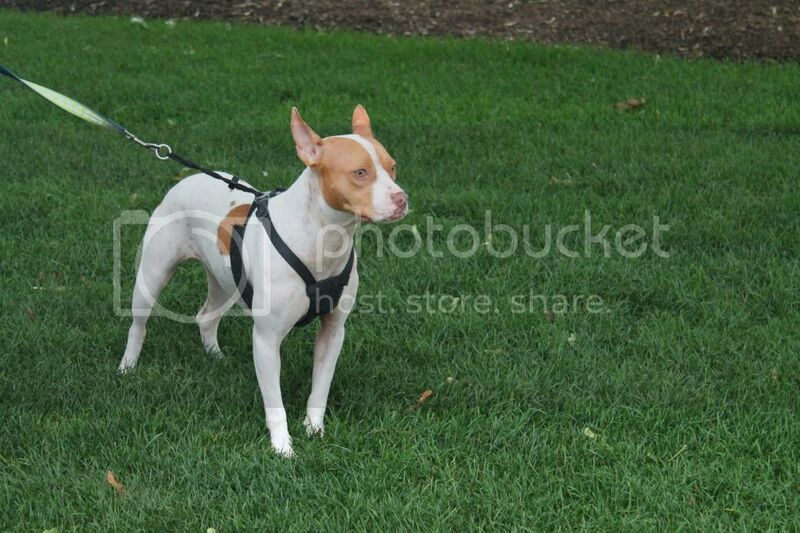 A alumni of Pack Ethic, Remi a female pit bull was there with her owners. Eric told me that when Remi she arrived at Pack Ethic as a mere pup she was so terrified of everything she wouldn’t even move. You can see now from her picture that she is very well adjusted and so, so sweet! Owned by a lovely couple right here on Long Island now, and living the life of love. I had a great conversation with Eric and it always so nice to talk to a fellow dog enthusiast, trainer, and animal lover who gets it. 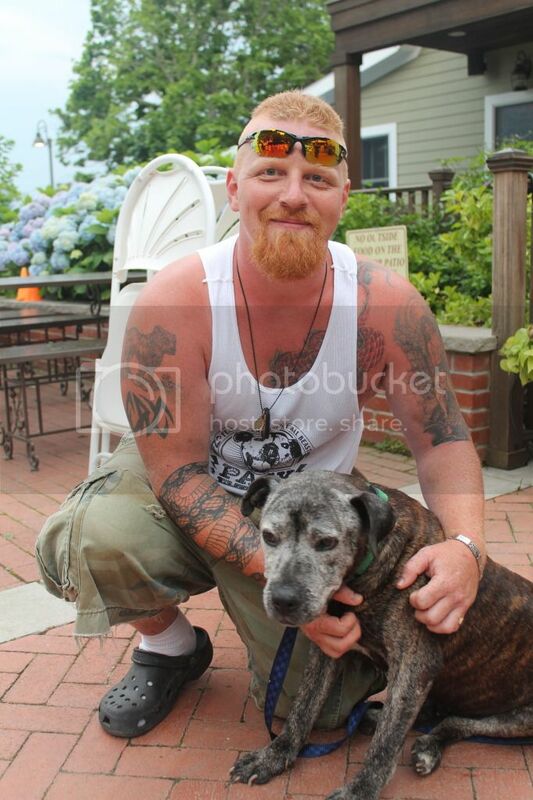 On hand to greet the many visitors was Vesper, an old dog who suffered a lifetime of abuse until Pack Ethic took him in. Vesper was on the move at the event practically the entire night, and he definitely knew who his people were with a happy wag and kiss to their faces, very sweet to see. Read his full story here. If you have never seen a video of the awesome work that Eric does with his pack, you have to check out his Youtube channel. It will not only put you in awe of the pack and of the day in and day out hard work Eric puts in. If you couldn’t make the event, and want to make a donation, click here, any amount will help. Pack Ethic Rescue is a registered 501c3 tax exempt charitable organization and donations are tax deductible.